OMG Posters! » Archive "Ultraman Hot Rod" Art Print by Jeff Lamm - OMG Posters! Kaiju heads, this one is for you. You probably remember Jeff Lamm (aka Greasebat) as the guy that released those awesomely tiny kaiju art prints on canvas awhile back. 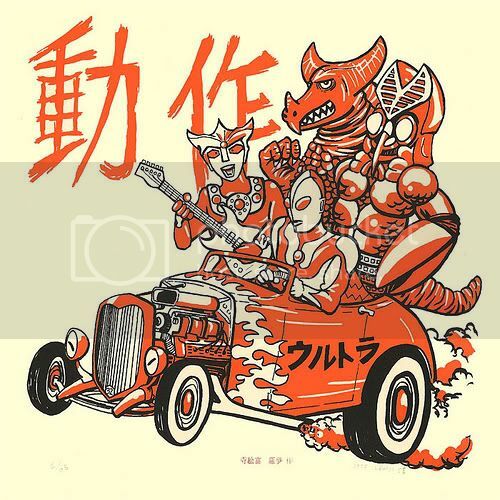 His new art print, “Ultraman Hot Rod” is a 12″ x 12″ signed/numbered screenprint for only $20. Pick one up at Super7Store.com.